This article is a short summary of New Super Mario Bros. U. New Super Mario Bros. U is the fourth entry in the New Super Mario Bros. series of Super Mario games and a launch title for the Wii U. The game is based upon the New Super Mario Bros. Mii tech demo at E3 2011, meant to show off the system's Off-TV Play capabilities. An all-new Mario adventure-only on Wii U! Push your Mario™ skills to the limit with the new Challenge and Boost Rush modes. Share your gameplay experiences with friends by posting messages straight to the World Map with Miiverse™. ◦ Boost Rush: Using Boost Mode, two to five players work together to clear many different courses in the fastest time possible. The scene auto scrolls, forcing you to move ahead through the course. As you collect more coins, the scene scrolls faster. Once you’ve completed your run, you can watch a replay of other players’ Boost Rush to help strategize for your next attempt. The New Super Mario Bros.™ U game offers new ways to play with the Wii U GamePad controller in a side-scrolling Super Mario Bros game for up to five people* and with Miiverse™ connectivity. Play through a new side-scrolling platform adventure as Mario™, Luigi™, Toad™ or even as your personal Mii™ character, swooping with the Flying Squirrel transformation or floating over enemies with the help of Balloon Baby Yoshi. The GamePad offers new ways to play, letting a fifth player join the action; he or she can place Boost Blocks and manipulate enemies to assist or challenge the other players as they try to reach the end of the level and rescue Princess Peach™. Additionally, a player can play directly on the GamePad in single-player mode, off-TV, while other people in the living room use the TV. Mario, Luigi, Blue Toad, Yellow Toad and Princess Peach are having dinner together when Bowser and the Koopalings arrive in their airships, grabbing the heroes out of the castle and flinging them into the distance. The heroes must now travel back to Peach's Castle to reclaim it from Bowser and rescue Peach. The game uses similar gameplay to previous 2D Super Mario games. The goal of each stage is to reach the Goal Pole within the given time limit, while jumping over obstacles and over or on enemies. The four-player simultaneous multiplayer featured in New Super Mario Bros. Wii returns here, allowing up to four players to play using a Wii Remote (or a Wii U Pro Controller in an update) though in this game a fifth player can use the Wii U GamePad to place blocks for the other players and stun enemies in what is known as Boost Mode; the GamePad can also be used when playing alone, for Off-TV Play. Other gameplay mechanics and items featured in New Super Mario Bros. Wii also return, though returning from Super Mario World are Baby Yoshis, of which there are three types, each with their own abilities. Miiverse integration is featured in the form of being able to post to Miiverse at the end of a stage at points, as well as displaying posts when the player dies. Players can also post at any point on the World Map, which is where the Miiverse settings for this game can be configured. The player may also receive a prompt to post after clearing a stage. New Super Mario Bros. U also features three additional modes: Challenge Mode, in which the player must complete specialized platforming challenges; Boost Rush, in which the player must play through a set of the game's stages in an auto-scrolling challenge that increases in speed as the player collects coins; and, also returning from New Super Mario Bros. Wii, Coin Battle, in which players compete by attempting to collect the most coins in a stage. 1.2.0 March 15, 2013 Sends any Miiverse posts made in-game to a new "Game Posts" community. 1.3.0 June 20, 2013 Allows the game to receive the New Super Luigi U DLC, adds a prompt to the main menu to go to the Nintendo eShop and download the DLC, adds Wii U Pro Controller support. New Super Luigi U logo. In 2013, an expansion pack titled New Super Luigi U was released to commemorate the Year of Luigi, a celebration of Luigi's introduction 30 years ago in Mario Bros. As the name implies, the expansion features Luigi as the star character rather than Mario (who is replaced with Nabbit, a new character introduced in the base game). While the base gameplay and world map remain the same, the stages have been replaced with brand new courses designed to be shorter but more difficult, and the time limit on every stage has been shortened to 100 seconds. New Super Luigi U was originally released on June 19, 2013 in Japan, June 20 in North America and Europe, and June 21 in Australia. It requires 731.4 MB of space to be able to download and install. The game was later released as a standalone title exclusively for the Year of Luigi, on July 13, 2013 in Japan, July 26 in Europe, July 27 in Australia, and August 25 in North America. 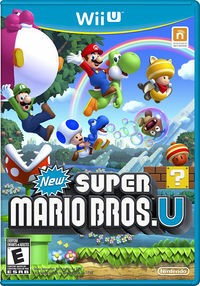 NA: October 16, 2015 A compilation release of New Super Mario Bros. U and New Super Luigi U on a single Game Disc, alongside several bonus videos. While originally available only with the Mario & Luigi Wii U Deluxe Set, the game was later given a standalone release. AUS: May 8, 2016 A standalone release of the game in the PAL region under the Nintendo Selects line. New Super Mario Bros. U Deluxe Nintendo Switch WW: January 11, 2019 A port of the game that includes the New Super Luigi U content and new features. ↑ New Super Mario Bros. U Deluxe - Announcement Trailer - Nintendo Switch. Nintendo (YouTube; September 13, 2018). Retrieved October 31, 2018. This page was last edited on 31 October 2018, at 23:26.